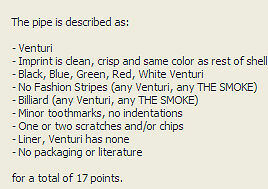 The value of pipe #637 is 17 points. Cynthia Phillips (pinkhues) had an auction for a lot of pipes on eBay. Two the pipe and a Venturi were in the lot. This pipe is no improvement to the collection, so it joins the Pipes for Sale page. The paint is nicotine stained and there is an abrasion (visible in the photo if you look carefully). The mouthpiece is good and the interior of the bowl is not bad. Richard Whiteman from Oman found my web site and added this one to his smoking rotation.